Quebbie DJ in a Box is your perfect solution for Weddings, Class Reunions, Corporate Events, Birthday Parties & Anniversaries, School & Church Dances, Holiday Gatherings, Block Parties, Fundraisers and so much more. DJ-In-A-Box is completely portable, and will be the life of the party! 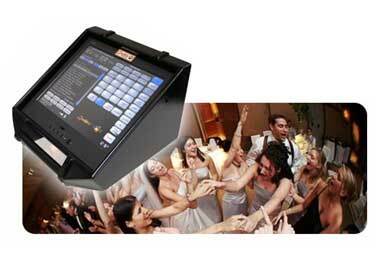 This easy to use and program music machine provides you with complete control over the music for your special event. With over 10,000 songs to choose from, you may pre-program the entire event as well as play instant requests on demand. "Quebbie DJ in a Box"Standard Music Categories"
"Quebbie Quebbie DJ in a Box" Wedding Music Samples "
Novelty Songs-Hokey, Pokey, Chicken Dance, Macarena, Cha Cha Slide, The Electric Slide, It's Raining Men, Cotton Eye Joe, Hot-Hot-Hot! What comes with my Quebbie system? Your "Quebbie DJ in Box" is ready to rent. The system with its easy to use software and over 10,000 songs and commercial grade touch screen are housed in a 1/4" thick road case. The touch screen flips up when opened for easy operation. A microphone for announcements, a small mixer to plug in the mic and a speaker. How long can I rent the Quebbie system? Your "Quebbie DJ in Box" rental is normally overnight. You will pick up your system on the day of the rental before 3pm and it needs to be back the next day by 10am. Arrangements can be made for early pick-ups and later drop offs. Can I add more or upgrade my speakers to the Quebbie system? Your "Quebbie DJ in Box" can handle up to 2 speakers. You can add up to 15" speakers. Can the Quebbie fit in my car? Yes, your "Quebbie DJ in Box" can fit in an average size car. You will have a speaker with your system and possibly a speaker stand which is 5ft long. Is "Quebbie DJ in a Box" like Karaoke? Does Quebbie replace the need for a DJ? A good DJ can be essential to a large wedding, especially when more than just music is needed. Quebbie is designed for use in smaller weddings and parties where the emphasis is more on just having good music. Also, Quebbie lets those customers on a budget afford great music who may not have room in their budget for a professional DJ Service. Quebbie has dozens of standard DJ announcements as well. You can hire one of our professional MCs to go along with your Quebbie. Does Quebbie come with music or do I have to purchase that as well? Quebbie comes pre-loaded with over 10,000 songs in 45 genres of music specific to the Party Rental industry. Additional categories of music are available as well. Quebbie has over 60 styles of music. Do I need special equipment to rent with the "Quebbie DJ in a Box"? Your " Quebbie DJ in a Box" easily connects to any commercial or home sound system as would a CD Player or Tape deck using standard RCA connections. You can easily rent Quebbie with or without a sound system, depending on your needs. Can I add my own audio promos and announcements? You can easily add up to (50) audio promos, commercials and announcements to your Quebbie. You can choose to have these spots play in a rotation from every song up to every 25th song. Each spot may be up to (90) seconds in length and can be easily created on any computer. Is the music legally licensed through the proper copyright associations? All of the music on the Quebbie system, as well as music added via updates, is covered under a standard music licensing and is legal to play for private parties. Most of our schools & churches hire DJ's that offer "cleaned up" versions of today's most popular songs. Are these type of songs offered on Quebbie? Quebbie is delivered with the radio edit versions of song selections. Every effort is made to ensure that the "clean up versions" are on Quebbie. Lyrics and content are sometimes subject to a wide variety of acceptance.